KOKOMO, Ind. 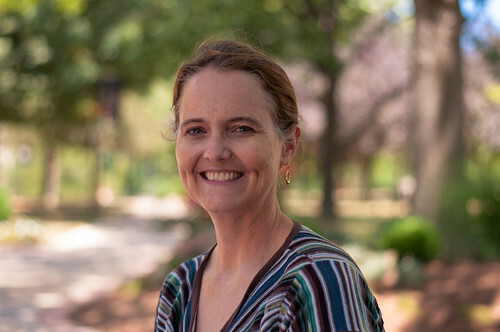 — Julie Saam has a passion for working with college faculty members, helping them to be not only experts in their field, but excellent teachers in the classroom. This semester, Saam, associate professor and assistant dean of the Indiana University Kokomo School of Education, is working with new IU faculty system wide, to develop them into outstanding educators, as the 2012 Bender FACET Fellow. "We want to prepare and support faculty so they succeed on our campuses," Saam said. "Our students benefit when faculty are prepared to be outstanding educators. Everything we do is about student learning." The Faculty Colloquium on Excellence in Teaching (FACET) is an IU organization for faculty members who are committed to being excellent teachers, and to helping others develop their teaching skills. Saam first became interested in working with new faculty as a doctoral student at IU Bloomington, when she was part of the Future Faculty Teaching Program. The program places doctoral students in faculty positions on regional campuses. It was led by FACET founder Eileen Bender, who inspired Saam to become a specialist in faculty development. "I will be looking at new faculty on all our campuses, to see how we can develop a networking process, and educate them on all the resources available to them as IU faculty members," Saam said. "A lot of times, when you are hired into a department, you may be the only person in your field, like the only science education teacher, on your campus. Through this program, I can introduce them to networking opportunities to meet others in their field." She will also prepare new faculty to teach effectively, noting that some graduate programs focus only on content area, not on preparing doctoral students to teach that content area. Interim Chancellor Susan Sciame-Giesecke said Saam's fellowship is well deserved. "This initiative is a good example of the benefits of collaboration among the IU campuses, and Julie is the right person to lead this effort," Sciame-Giesecke said. "As a teacher, she exemplifies Eileen Bender's passion for teaching excellence. Our new faculty will establish important relationships to further their teaching and research." FACET created the Eileen Bender fellowship in 2011 to create leadership opportunities within the organization, preparing members to gain a greater understanding of the system-wide impact of FACET and potentially prepare them to be program director.